What happens to crash reports? 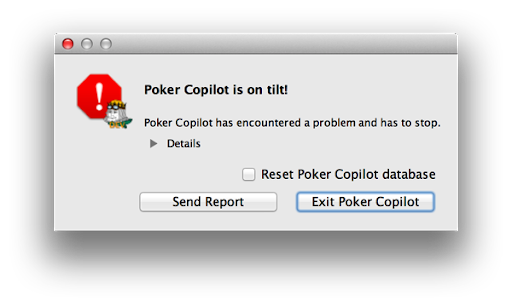 Did you ever get this message in Poker Copilot? Those details are almost as incomprehensible to programmers as they are to you. At first. But as programmers spend time supporting software, they get better at analysing the crash reports. Over time they can use it to pinpoint some problems they didn’t know could exist. 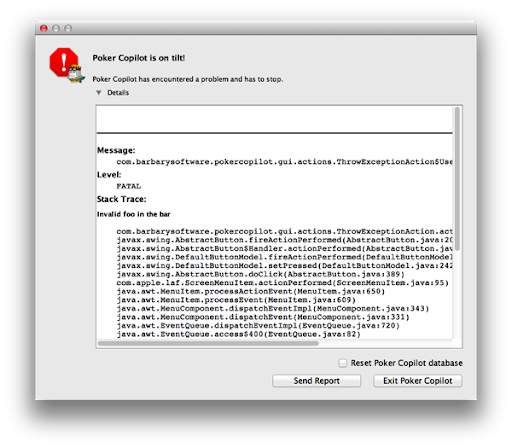 Here’s what I do with Poker Copilot crash reports when I receive them. Is this for the latest Poker Copilot update? If not, discard it, as the problem might now be fixed, and recent changes to code will make the crash report hard to use. So it is for the current update? Use it to find the problem immediately, on the day the report was received. Fix the problem. Add the fix to the next Poker Copilot update. Over time this makes a product more and more solid. At first the issues are common problems. Over time the problems that are left become esoteric problems that might affect one person a month. Please do send crash reports when they happen. They do get to me. I do use them. In fact, I use them religiously because let’s face it, we want our software to be as solid as possible.